KATHLEEN HILL was in a bookstore in Seattle one day, browsing through the travel and cooking sections, when she noticed there were no books on the Sonoma Valley area. It got her thinking about the advice her late friend M.F.K. Fisher had once given her: "Write about what you know and love well." Hill, a resident of Sonoma, had just finished work on a dictionary with Gerald, her husband and writing partner. The idea of writing about food and travel, she says, sounded like heaven: all those complete sentences. The first two books were self-published tours of Victoria and Vancouver Island, where the Hills spend part of each year, and Sonoma Valley. Positive reviews from publications like Wine Spectator helped spread the word, and the authors soon were approached by the Globe Pequot Press. Only a couple of years later, the series of Hill Guides is five books strong, and a sixth, on Santa Barbara and the central coast, is poised to come out "at any second," Hill says. The Hill Guides (Globe Pequot Press; $14.95) are a remarkably readable series of travel books that happen to focus on food and wine. In addition to the usual rundown on where to stay and what to gawk at, the guides include colorful, opinionated descriptions of the best local restaurants and wineries, interspersed with gourmet recipes from the chefs along the road. The effect is mouthwatering. The "How to Be a Visitor and Not a Tourist" section in each guide offers tips on how to enjoy yourself without alienating the locals; in general, being quiet and respectful of others seems to be what goes over best. However, there are exceptions. "Don't worry about looking like a tourist in Napa Valley," write the Hills. "The Valley is made for tourists! The wineries and restaurants thrive on your visit and are well aware of that fact, so you will be treated well. Just dress comfortably and bring your tastebuds and money." 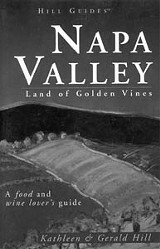 The Napa Valley guide is new this year, as are guides to the Monterey and Carmel area and the Northwest Wine Country. The geography of the latter includes British Columbia, Oregon, Washington, and Idaho "in the Cascadian spirit of natural rather than political boundaries," the authors write. "Nature does not know governmental borders, and we believe that humans ought to ignore them a little more. We would like to encourage people to live more regionally and less provincially." That sense of region shows up strongly in the Hills' writing, which is warm, chatty, and knowing throughout. The small picture of the authors on the back cover of each book enhances an overall feeling of intimacy, as if the reader has been invited along on a family expedition. It's a quality that big-league guides like Fodor's and Frommer's conspicuously lack, even if they may be more encyclopedic. Though yupscale tourists are clearly the target audience here (who else splashes out for a weekend of winetasting in Napa? ), the Hills never condescend or assume. True, the $65 prix-fixe menu of Yountville's renowned French Laundry gets a mention, but so does the greasy-spoon ambiance of Ford's Cafe in Sonoma, of which the Hills write: "The walls tilt slightly, the people tilt slightly, the American flag gets stolen, and the building floods when Sonoma Creek overflows." Wine, a popular if controversial product around these parts, gets an appreciative but not gushing treatment in the Hill Guides. A section at the back of each book highlights the history of the region and the effect of the wine industry before, during, and after Prohibition. "We see a couple of attitudinal differences that distinguish British Columbia wineries from U.S. wineries, particularly those in California," write the Hills. "Generally B.C. vintners help each other instead of competing against each other. Many B.C. vintners are content to sell the wine they make and stay small, instead of aggressively striving to top their own or someone else's sales figures. . . . Many B.C. wineries sell out their releases each year." Even those who like the taste of wine but can't tell an oaky cabernet from an impetuous syrah are encouraged to relax and enjoy. "Either learn winespeak thoroughly or don't worry about it," say the authors. "The faker is the only one laughed at." From the November 11-17, 1999 issue of the Sonoma County Independent.